If you have 60 seconds, you can learn about an important issue affecting water and potentially help a Wilfrid Laurier University graduate student win a national contest. Rachel Henderson’s video, “Isn't it IRONic,” has been named one of the top entries in the Natural Sciences and Engineering Research Council of Canada (NSERC) Science, Action! video contest. If her video is one of the 25 most viewed by March 27, it will go on to the judges’ panel, where it could win a prize of up to $3,500. The 15 top videos will also be featured as part of museum exhibits, science fairs and during Science Odyssey and Science Literacy Week. Henderson’s video focuses on the relationship she is researching between iron and algal blooms. Toxic algal blooms do more than make water scummy. They can kill fish, sicken animals, close beaches and affect drinking water. Climate change is worsening algal blooms and Henderson, a second-year geography master’s student, is trying to do something about it. Specifically, Henderson is researching how access to iron might favour the growth of cyanobacteria, or blue-green algae, some types of which can form toxic blooms. It’s already well known that nitrogen and phosphorus, two key ingredients in commercial fertilizers, contribute to algal blooms, and efforts exist to try to control the runoff of those nutrients. However, iron is increasingly thought to also contribute to algal blooms. “This research could strengthen the need for managing iron sources in lakes that are affected by toxic algal blooms,” says Henderson. 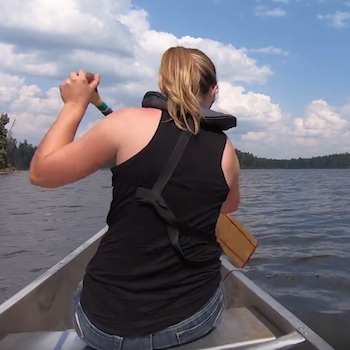 Henderson decided to make the video in part because she enjoys creative activities in addition to science and in part because she wanted to help promote the Experimental Lakes Area (ELA) near Kenora, where the not-for-profit International Institute for Sustainable Development (IISD) operates what amounts to a series of whole-ecosystem outdoor labs along with traditional indoor lab facilities. All you have to do to help Henderson win is watch the video – and maybe share it on social media.